]When I graduated college, I got to sit in a huge crowd of starry-eyed young adults just like myself. We heard inspirational speeches from past graduates and business owners and chatted amongst ourselves about our aspirational plans for the future (for the story’s sake, forget anything about our current unemployment rates). I even got to shake hands with the college president. Unfortunately, when these chickens graduate, they don’t get degrees – they become cutlets and ground chicken and sausages. Though in this economy, is that preferable to tackling post-college employment prospects? “Smart Chicken” uses chicken that are certified organic, certified humanely raised and handled, eat a trademarked vegetarian diet, pesticide/herbicide/hormone/antibiotic free and maybe even a certification that doesn’t even exist yet. It kind of seems like a shame to eat them. Then again, I gotta have some standards. I admit, some of my eating habits mirror that of a 20s-something bachelor. I’ll drink milk from the carton when no one’s looking, I’ll tackle a steak the size of my face or bust into a six egg omelette (one day I’ll conquer a twelve egg). 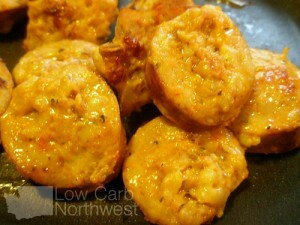 I was kind of disappointed that unlike Trader Joe’s or Aidell’s brand chicken sausages, these are not precooked. I can’t just take one out of the package, zap it in the microwave and eat it while watching a action movie. Not that a proper young lady like myself would do that. What’s nice is that the ingredient list is pretty straightforward and simple: chicken, hot Italian seasoning (black pepper, fennel, red pepper, anise, paprika, sugar, dehydrated garlic), salt, vinegar, natural flavoring, in a natural pork casing. I’d definitely stick with these over a “normal” hot dog. 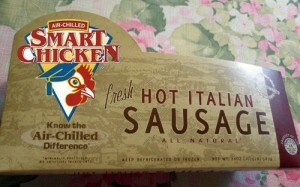 In addition to hot Italian chicken sausage, Smart Chicken also offers a sweet Italian version and a bratwurst. Now I want some sauerkraut. And of course the most important thing – taste. I enjoy spicy foods and these did not disappoint. They definitely brought a bit of a tingle to my mouth. The whole fennel seeds dispersed throughout the link brought a nice herb-y crunch paired with the heat. Fun video: Here’s a wonderfully crude Soviet era TV advertisement for ground chicken from the late 1980s – while the title mentions “Vegetarian Nightmare”, some meat eaters might feel uncomfortable as well. This entry was posted on Tuesday, February 1st, 2011 at 6:00 am	and is filed under Food. You can follow any comments to this entry through the RSS 2.0 feed. Both comments and pings are currently closed.